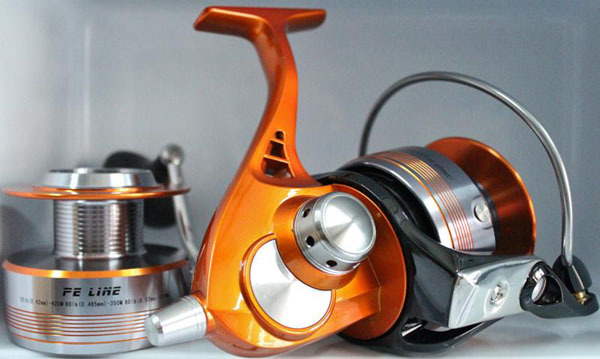 Today we examine Ryobi's flagship spinning reel, the Carnelian. For those who are not familiar with the brand, Ryobi is a Japanese company better known for its power tools, and in the 1990s it was considered one of the big three Japanese fishing gear makers. 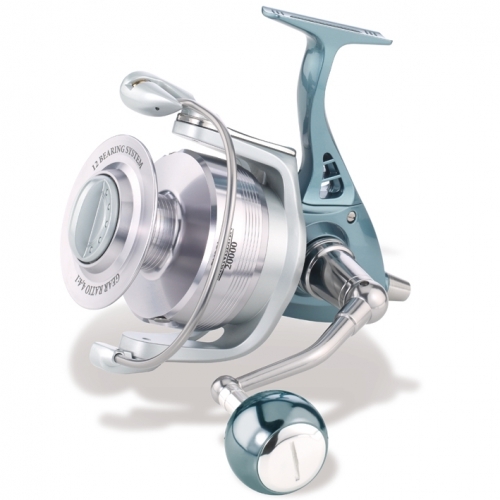 Their flagship reel "Fishing Safari" was at one point considered in the same league as Shimano's and Daiwa's flagship heavy duty saltwater reels. Here is a part of an ad for the original Japanese made Fishing Safari that I saved on my computer about a decade ago. 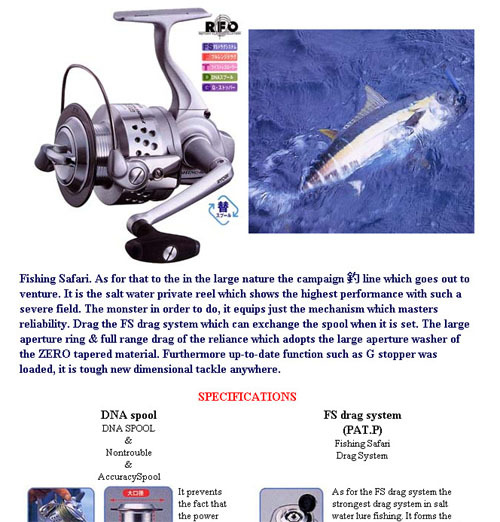 The full ad is too long to post here, but the rest of it showed some of its features, including patented ones such as "Rotary Flat Oscillation", and that thing which allows the spool to be changed without changing the drag setting, later incorporated in Accurate's TwinSpin reel. 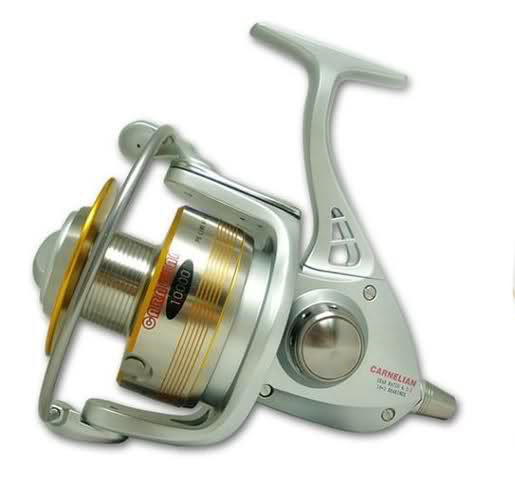 Anyhow, sometime around the year 2000 Ryobi sold the fishing branch of its business to a Chinese firm, and since then all Ryobi reels have been made in China. 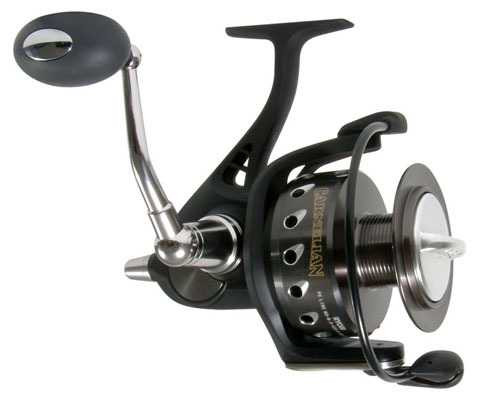 They still make the Safari 5000A to the original design except with a round handle knob, and it still has a loyal following despite the old design and lack of modern features such as the instant anti-reverse, essential for serious jigging and popping work. The Carnelian is yet another attempt to produce a low cost alternative to the super spinners, namely Stella and Saltiga. Here is a quote from the introduction by the Australian distributor. Creating a low cost alternative to super spinners is something that many have tried to achieve in response to the immensely growing popularity of offshore jigging and popping over the past decade. That market is still expanding, and more companies are jumping in to try their hand at making that illusive low cost alternative. I've examined virtually every example of such reels, and there were maybe a couple of hits (or semi-hits) among countless misses. Naturally I become more hopeful each time because whomever made the reel in hand must have learnt something from the ones who tried before. I bought mine for 200 Euros, which is about $255. Could be bought for slightly less from Asia, but I did not want to go through the hassle of paying VAT and import duties so I ordered from Italy. And black with a slightly different spool and plainer drag knob for the UK and Australia. 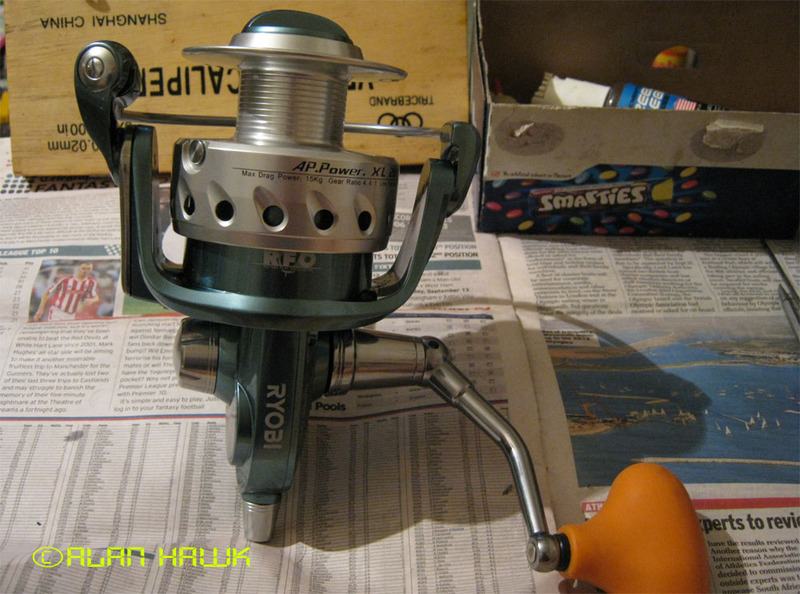 And in Italy it's called "Tubertini Ryobi Ap Power XL", which is my own reel that you'll see soon. 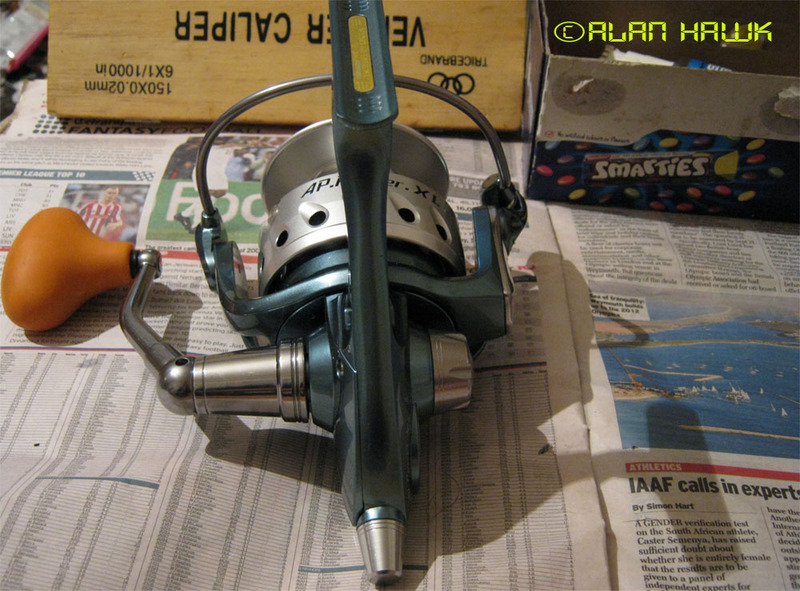 Just need to point out that the reel comes in two sizes, one has a slightly bigger spool capacity than the other. Those two sizes are called either 10000 & 12000 in some markets, or 18000 & 20000 in other markets. Don't get confused thinking that there are 4 sizes. Only two sizes exist with different names: The 10000 size is equivalent to 18000, and the 12000 is equivalent to 20000. The above list is by no means exclusive. The reel could pop up somewhere else bearing more names and in different cosmetic variations. 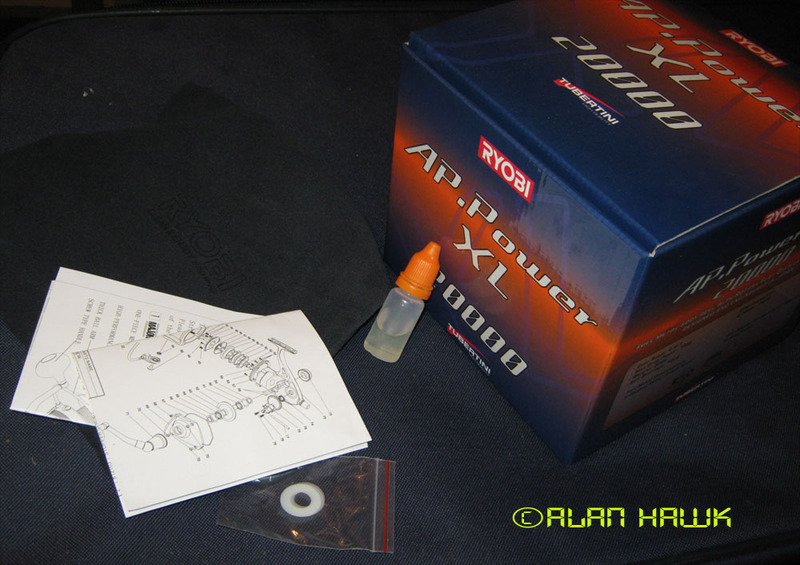 Parts diagram, instructions, a bottle of oil, a cloth reel bag, and a couple of spool shims in a plastic bag. Those accessories may differ according to the region where it's sold. For example the "Kewl Forge" comes with a spare spool. It weighs 911 grams (32.15 oz), which is considerably heavier than the biggest Stella and Saltiga and even a tiny bit heavier than the hefty TwinSpin 30. The versions with metal handle knob would weight 10-15 grams more. As usual I ignored the advertised line capacity and found out myself. 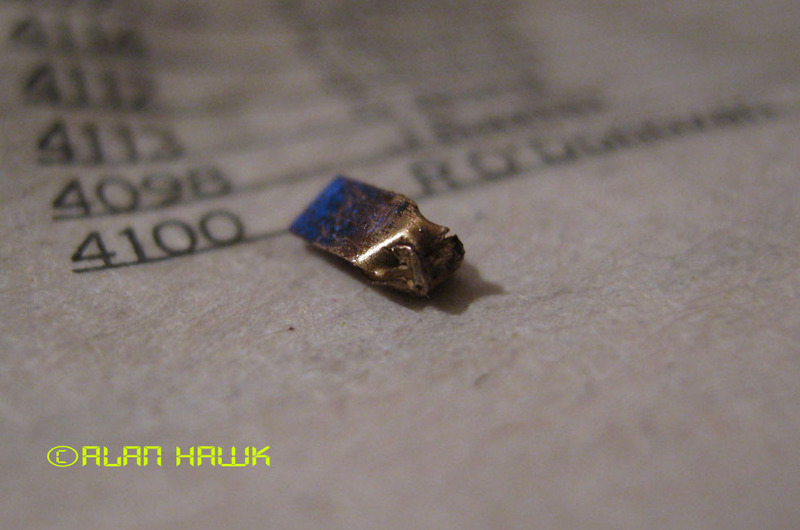 It held 310 metres (339 yds) of PE8 line which is 0.47mm (0.018 inch) thick. Those figures should help you figure out how much it will hold of your favourite line. 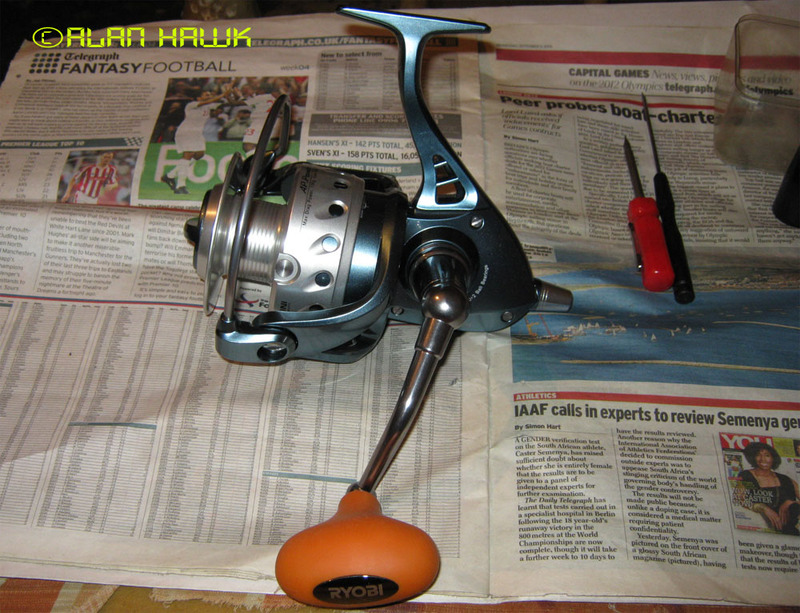 The reel is advertised as having a maximum drag of 15kg (33.1lb). Before I hit the water I measured it to be sure there will be no surprises, and I got 17.7kg ( 39lb) with an empty spool, and 14.3kg (31.5lb) with a full spool. Not bad considering that it's not exactly an easy task to withstand 31.5lb of drag for a long time standing up. I usually begin by showing you the drag, but this time I will start somewhere else because of an unusual event: On my 6th and final test trip with the reel, the drag went silent on me! It still worked and all, but the buzzing sound it makes when a fish pulls the line disappeared. I took the spool off and looked expecting that the clicker had fallen off, but the clicker was there and it looked fine. The action was good and fish were hungry, so I put the spool back immediately and finished that day with a silent drag. The clicker itself was fine, but the wire spring (red arrow in the photo above) that keeps the clicker centred was missing one of its two lugs! That made the clicker lay to the right with nothing to spring it back hence the sudden silence of the drag. #1 are the two ball bearings the spool spins on, and you can see the carbon fibre drag washers with no grease at all on them. When I fished the reel I immediately noticed that even at low settings the drag had a bad jerk at the beginning of the run. In other words the drag spiked and had a high starting inertia. I expected to find unsuitably sticky grease on the washers, but to my total surprise there was no grease at all. I wasn't exactly happy about that because the main job of drag grease is to create an even heat distribution for better dissipation, just like that white paste you see on a computer processor when you take off the fan and the heatsink. 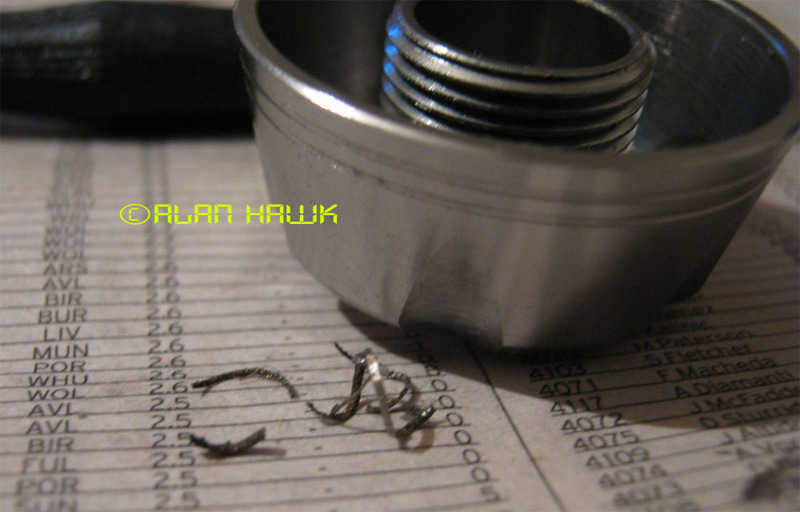 The drag grease is therefore required mainly for uniformity in performance and wear resistance. The absence of grease though does not cause stickiness on woven carbon washers, so I left the washers dry as they intended them to be. 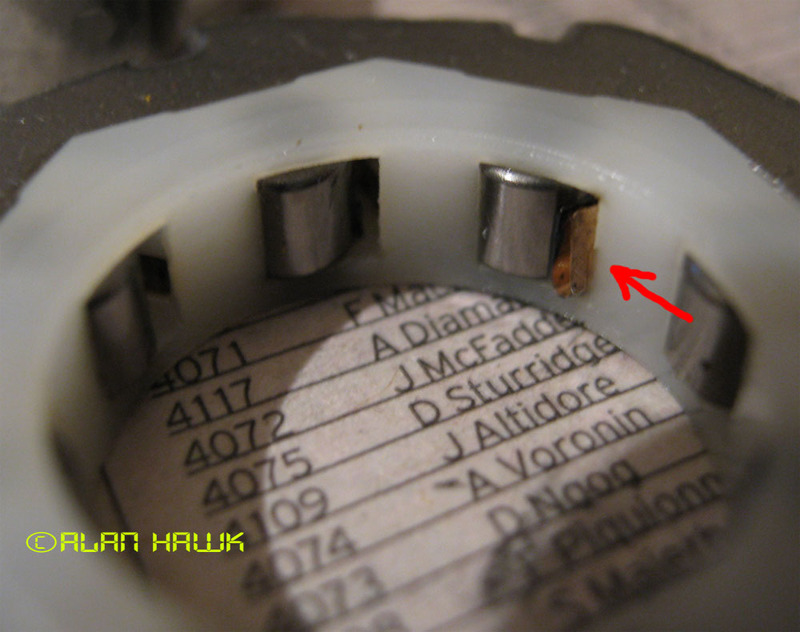 Still in the above photo, #2 is a metal washer stained by carbon powder on its edges from usage, and the red arrow points to the drag knob's seal. 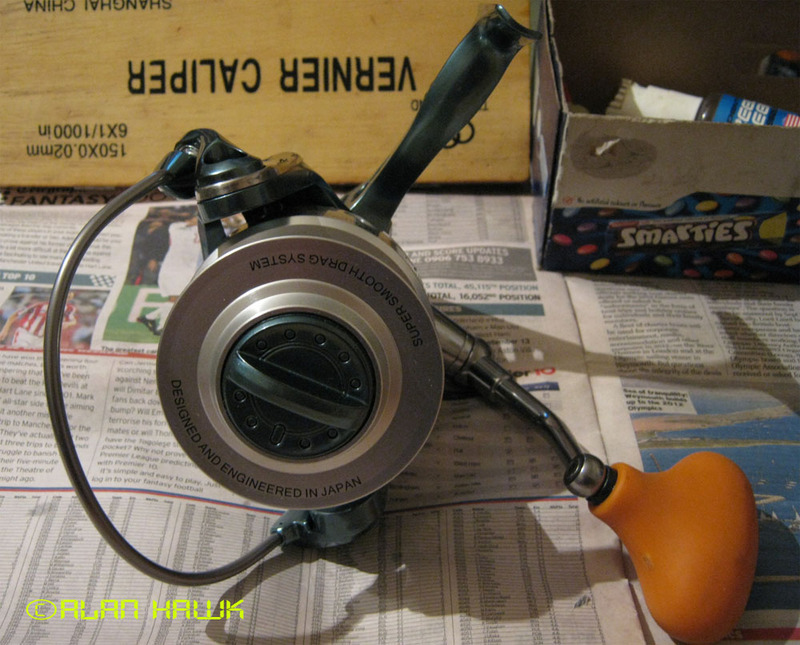 The reel is advertised as having a waterproof drag and body by the way. We will come to that later. The red X marks the housing of the lower drag. The red arrows point the springs of the two line clips. I hate line clips in general and believe that they belong on toy reels, but at least the ones on the Ryobi will not snap if you clip thick leader under them. 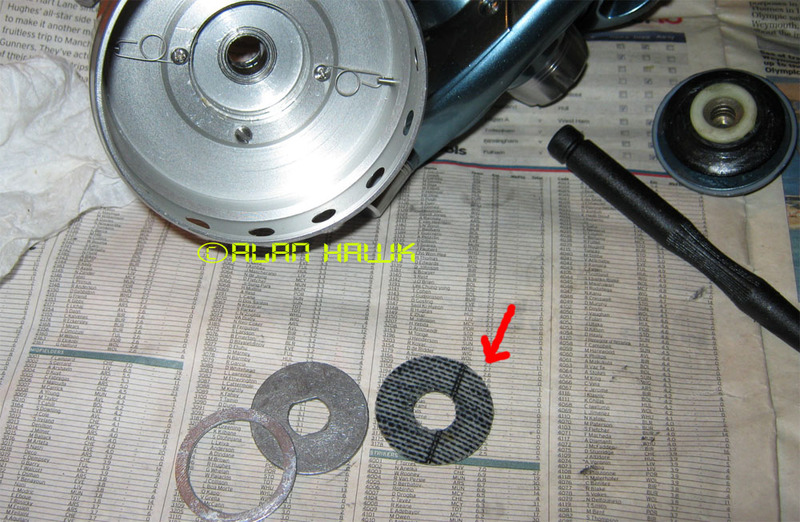 Only one drag washer underneath the spool (red arrow), along with a metal washer and a spacer. 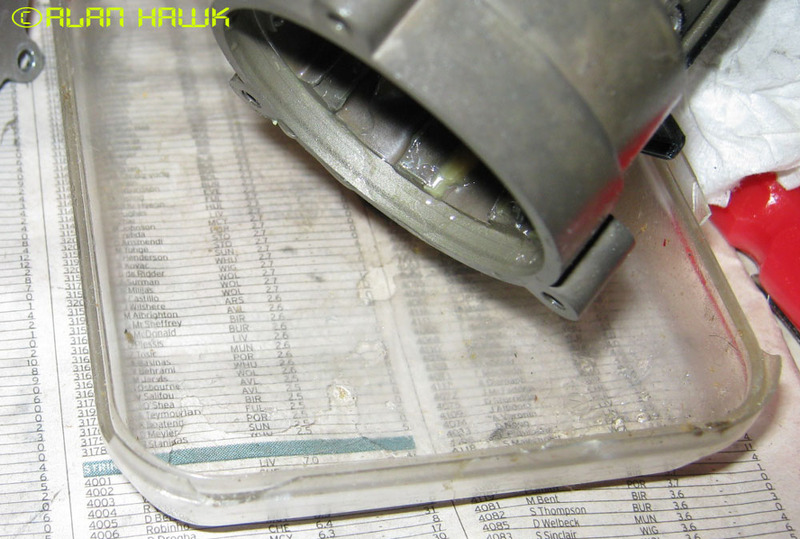 Unlike the upper drag stack, this washer came heavily greased with thick sticky grease, and that's what was causing the jerk in the spool at the beginning of a fight. 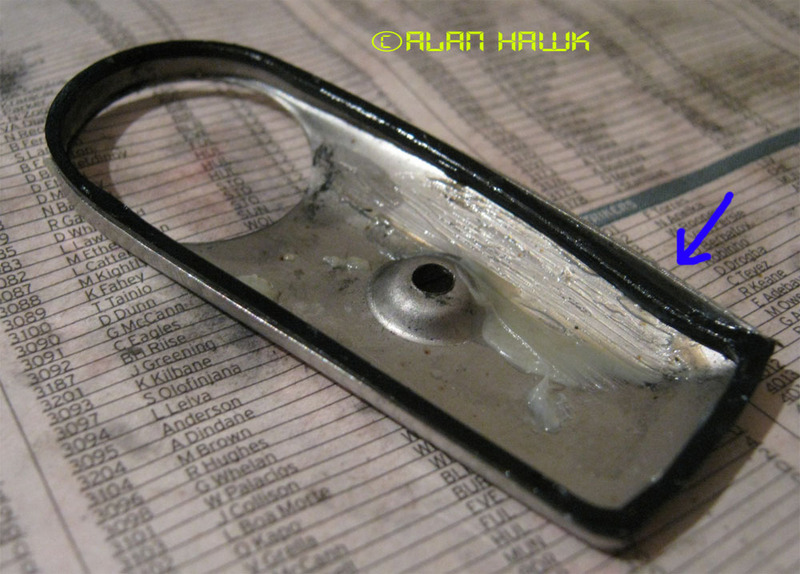 After I cleaned it off and applied better drag grease, the overall performance of the drag improved. While the spool is protected against water on the top by the knob's seal, there is no water protection whatsoever underneath the spool due to the complexity of sealing that lower drag system. In my humble opinion this whole setup is a bad idea. When someone puts a drag beneath the spool they take advantage of the space and use very large washers and reduce the diameter of the spool's spindle to increase line capacity. But in the Carnelian the washer beneath the drag is only marginally bigger than the washers in the top stack, therefore they should have just done away with that whole lower drag setup and added one more washer to the top stack. That way they'd have spared themselves the added parts and machining underneath, and they could have sealed the spool from below as well. That orange grip is pretty rubbery and won't slip. 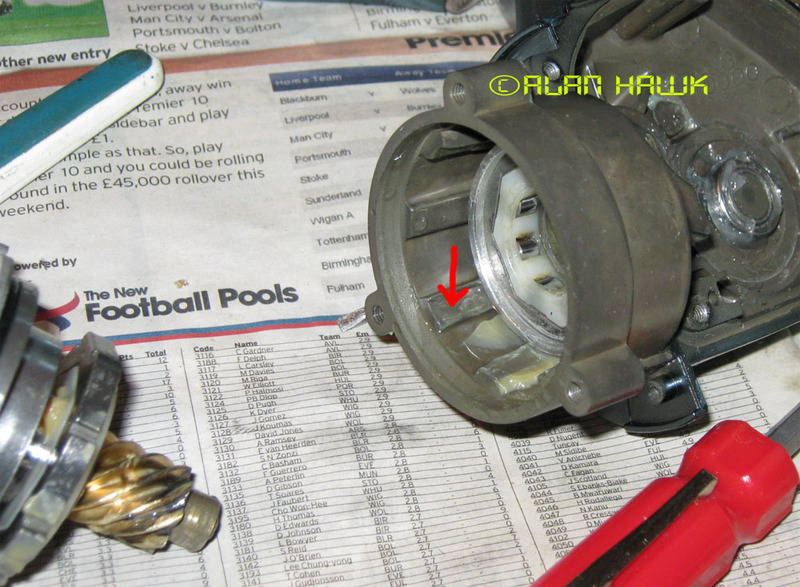 Inside though you can see a few rubber shavings (red arrow) typical of low cost synthetic parts. The grip spins on a single ball bearing (red X) that fits in the end closer to your palm. When I unscrewed the body cap to screw the handle on the right side, these metal shavings fell from inside the main gear's tubular axle. 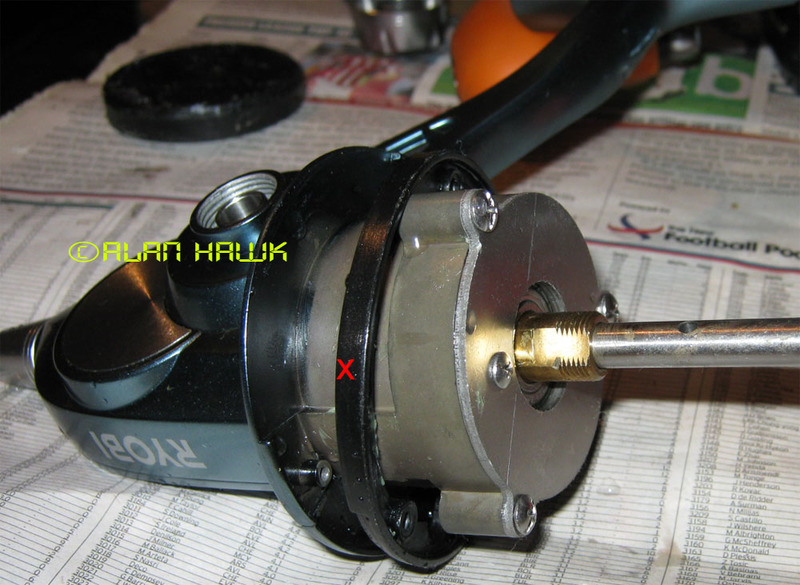 The red X in the above photo marks the rotor's nut. It's a closed type nut that fits closer than usual around the shaft. 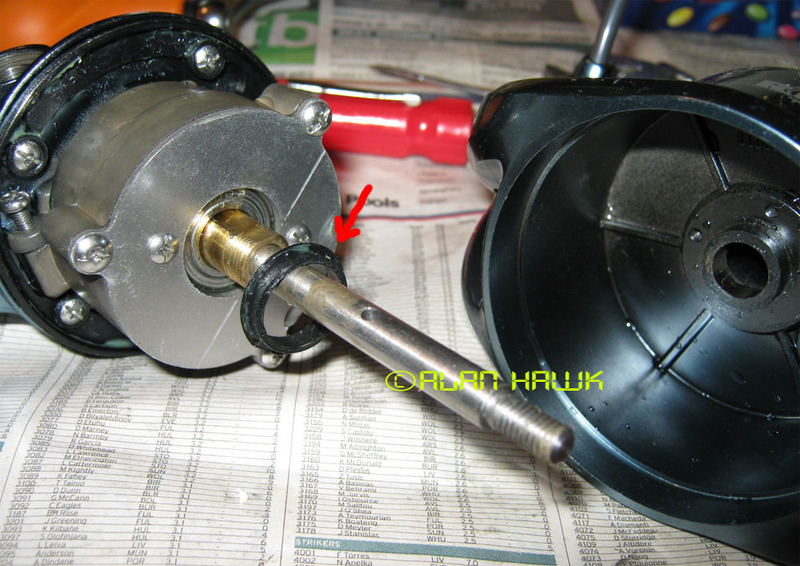 The red arrow points the rubber ring on the spool hub. It looks like some sort of a seal for the spool, but it isn't. This ring does not come in contact with the spool at all. 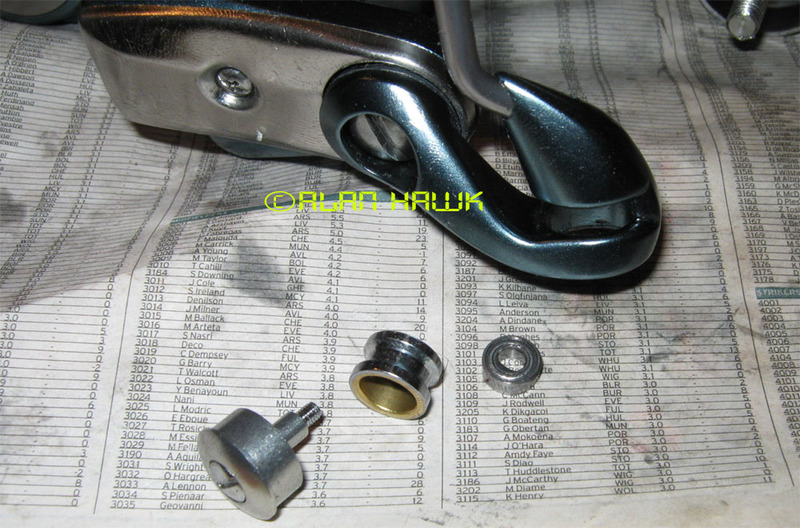 It's just a retainer for the cross pin attaching the hub to the shaft. Here is the hub off the shaft. I find it to be overcomplicated needlessly. Can think of at least 5 other designs for this purpose that are simpler and lighter. 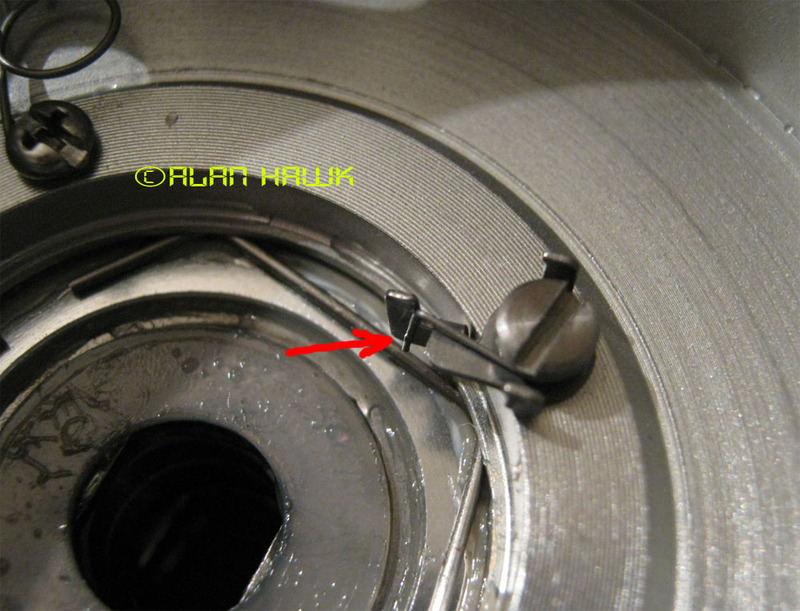 Removing the nut exposes another O ring (red arrow) that seals the opening between the pinion and the shaft. It does the job effectively. 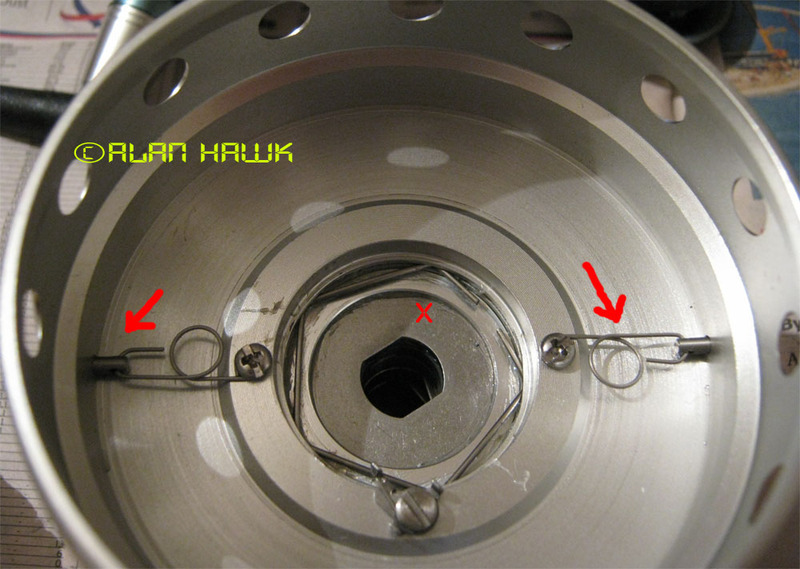 The red arrow points another effective seal that seals the space between the rotor's neck and the pinion assembly cover. The red X marks the rotor brake ring. When you open the bail to make a cast, a lever engages this ring and stops the rotor from moving. The rotor brake of the Carnelian is strong, as strong as the bake of the bigger Stella (18000 & 20000) indeed. Those of you who use the big Stellas know how powerful their rotor brake is. 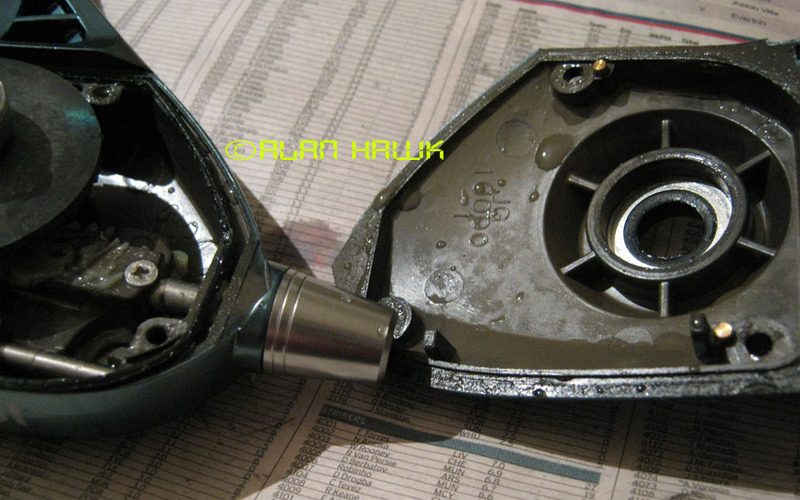 Not the best sight to see inside a "waterproof" gearbox. The reel was not submerged nor subjected to any crazy tests. Its exposure to water was limited to being left in a rod holder or a gunnel mount while the boat went from a location to another, and I gave it a tap rinsing after each trip, the last of which was shortly before the disassembly for this review. 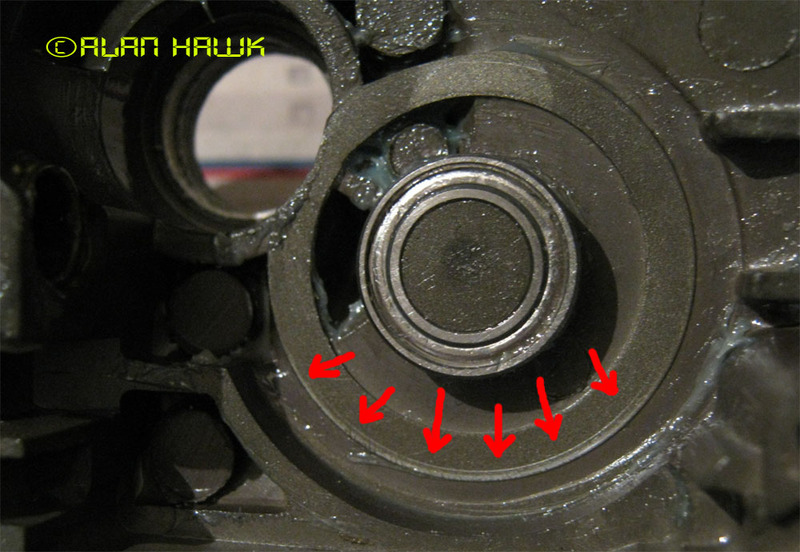 There is a body seal (red arrow above) that goes around the entire perimeter of the gearbox. And even though it was not very well fitted, it wasn't responsible for the water invasion. 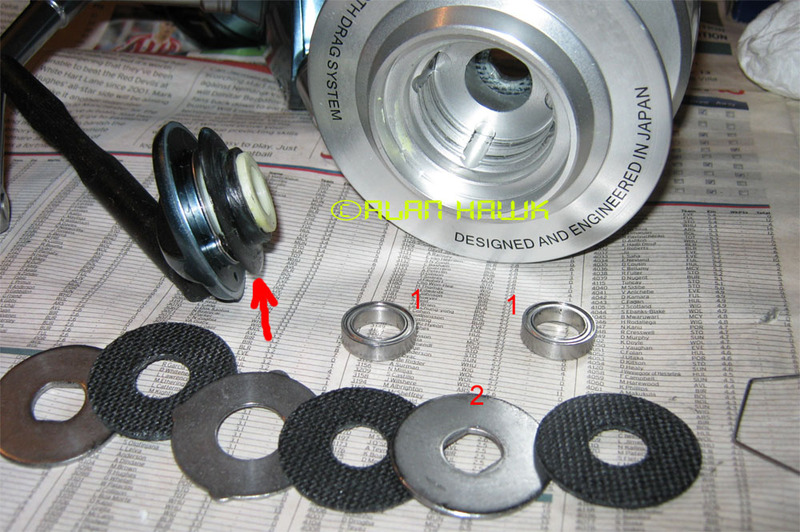 In the photo above you can see a seal (#1), a washer (#2), and there is a ball bearing that tops both which is not shown in the photo. 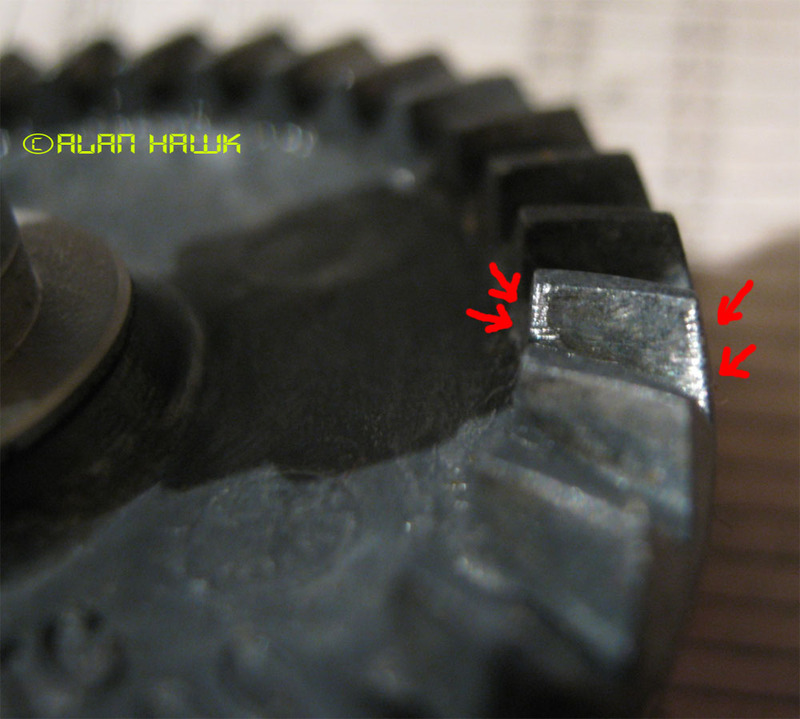 The gearbox has an internal sealing setup on both ends of the drive gear's axle, similar to the setup of the old Saltiga, except that it's missing something! 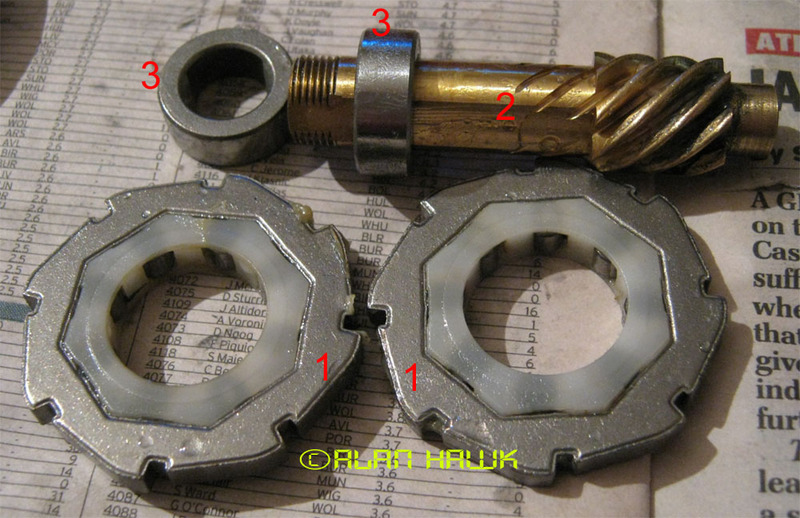 In the old Saltiga screws were used to hold the bearing down, which in turn kept the seal pressed against the cover creating an efficient water stop. In the Carnelian though there is no such retainer, hence when the bearing moves sideways with the movement of the drive gear, the seal isn't pressed down and it lets water in. 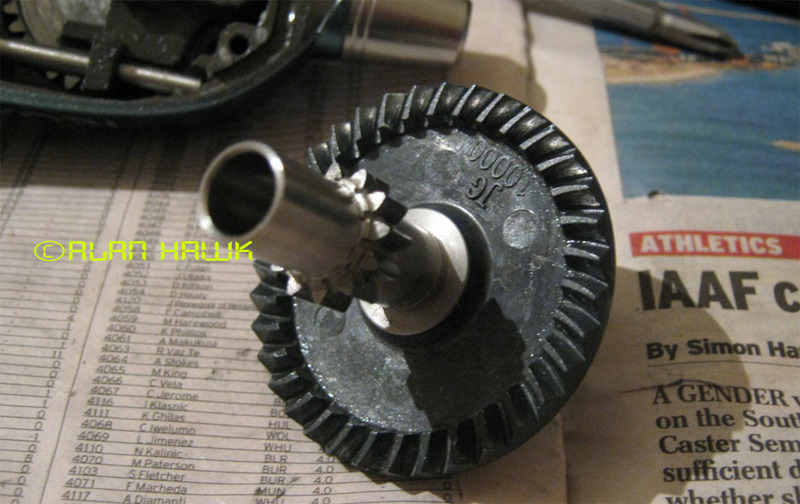 Of course the drive gear must be allowed a slight side to side play for proper operation. If it's shimmed tight the teeth will wear rapidly. A bad design flaw in the Ryobi that renders all its sealing useless. 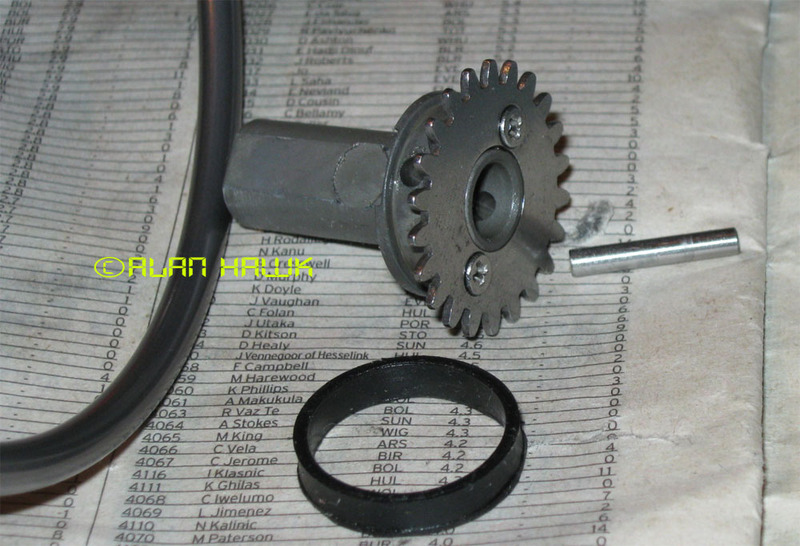 The drive gear is cast zinc with a grey surface coating. 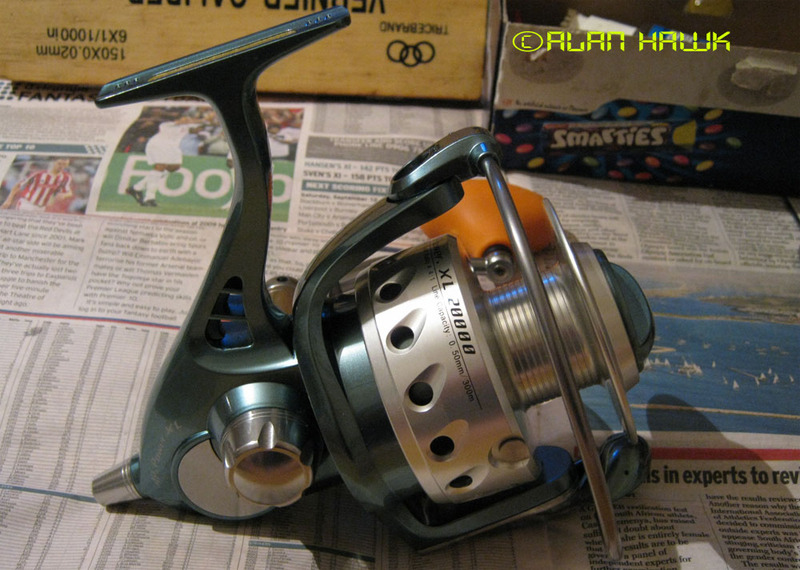 When I first turned the handle of the reel I liked the smoothness. And I'm talking about the correct definition of smoothness which is silent and fluid gear operation. First day on the water, about the 10th or 15th drop, I began noticing that the reel was becoming rougher and gears started making whirring noises. I've fished reels that lost smoothness with use, but the Carnelian went there in a record time on the very first day. Over the following 5 trips the whirring became noisier and it developed grinding as well. Not the kind of scary grinding that makes you put the reel down and send it for repair, but nevertheless it was easily felt and heard and I didn't like it. This does not happen because of foreign particles in the drive train as one would be inclined to believe. When the teeth have irregularities and high areas, those areas don't just smooth themselves out. 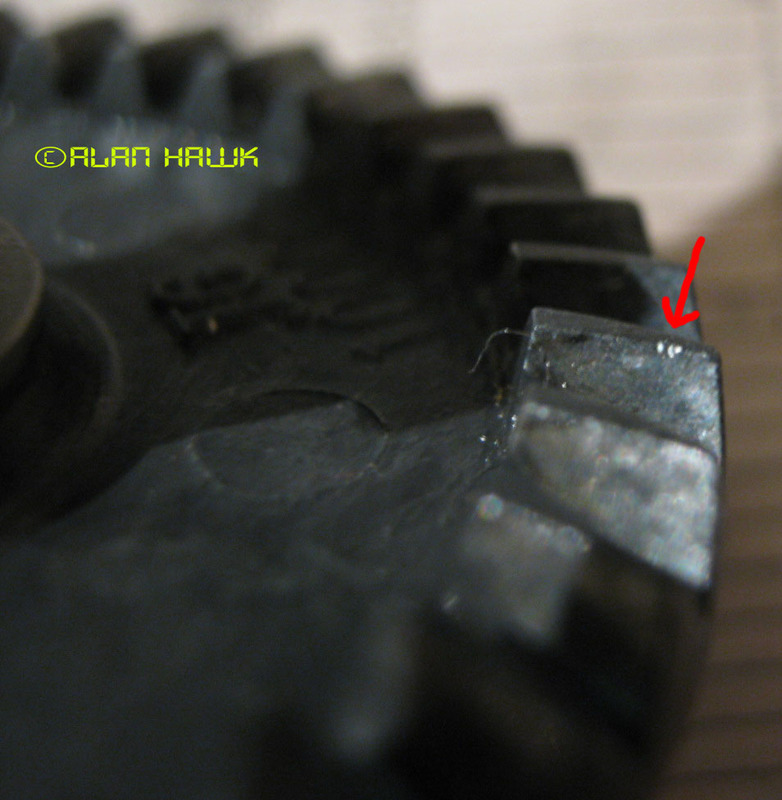 Rather when subjected to friction they break off taking more metal with them and leaving rough areas that damage the pinion's teeth, and the damaged pinion teeth in turn wreaks move havoc on other parts of the drive gear. It's hard to capture the depth of the wear marks on camera, but I tried and marked the wear region with red dots in the photo above. The same is found on each tooth. 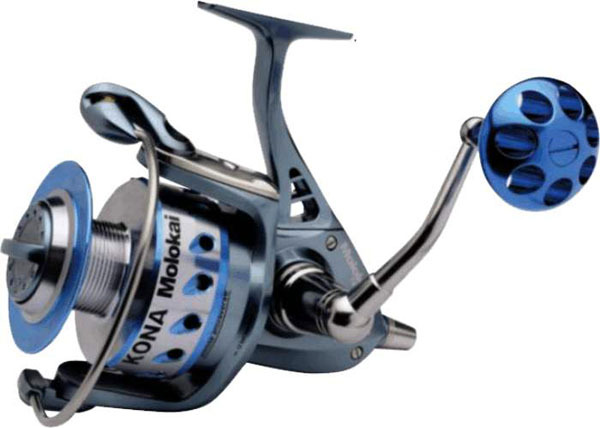 As I explained before, I have a completely unscientific way to assess the wear resistance of a gear: I examine how much it has worn relative to the amount of use it has seen, then using my senses and experience with a huge number of reels I make an assessment. Using that methodology I would say that the gear of the Carnelian is one of the weakest and fastest wearing gears I've seen on any spinning reel. It's that extreme. The traverse cam (#1) rides on a stainless steel rod (#2). 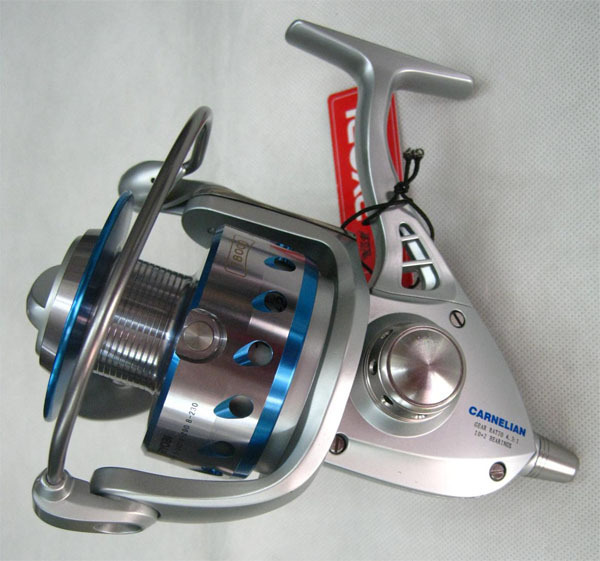 Most of you know what that is, but for those who don't, in most reels when the reel is under load by a fighting fish, the spool twists the shaft clockwise and the traverse cam attached to the shaft rubs hard against the body and causes friction and wear. Modern reels have several ways to cancel that effect, and mounting the cam on a stainless steel rod, as is the case in the Carnelian, is one way that works great. 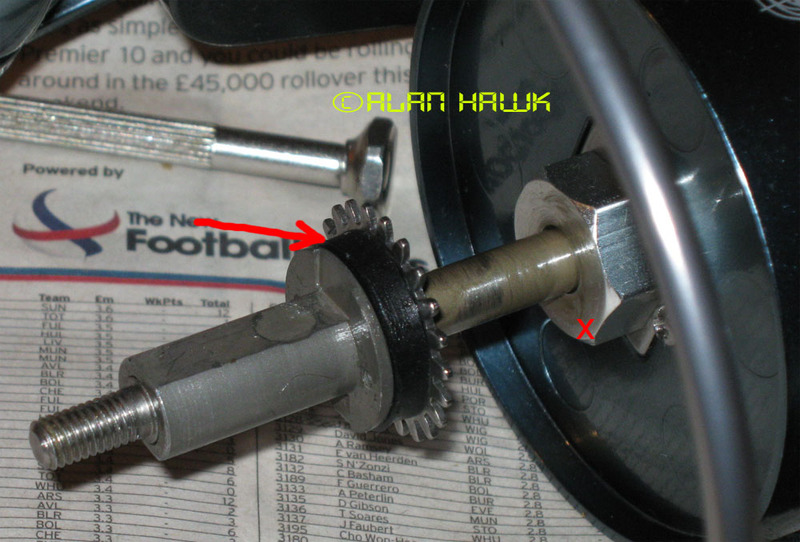 Still in the photo above, #3 is the second ball bearing of the drive gear, and underneath it a setup identical to the one shown earlier: A seal and a washer. The oscillation gear (#2) is another die-cast zinc piece, and it runs on a ball bearing (#1) that is pressed into the reel's body and can't be removed. 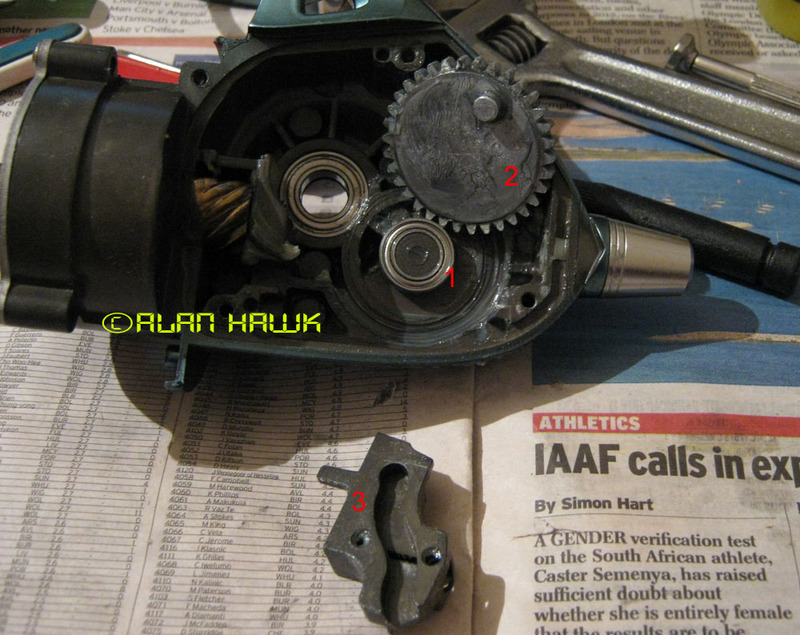 #3 is the traverse cam which -strangely- showed better wear resistance than anything else inside the gearbox. A closer look reveals that the oscillation gear is rubbing against the reel's body and scraping off the finish. It's not bad yet because the reel hasn't been used much. 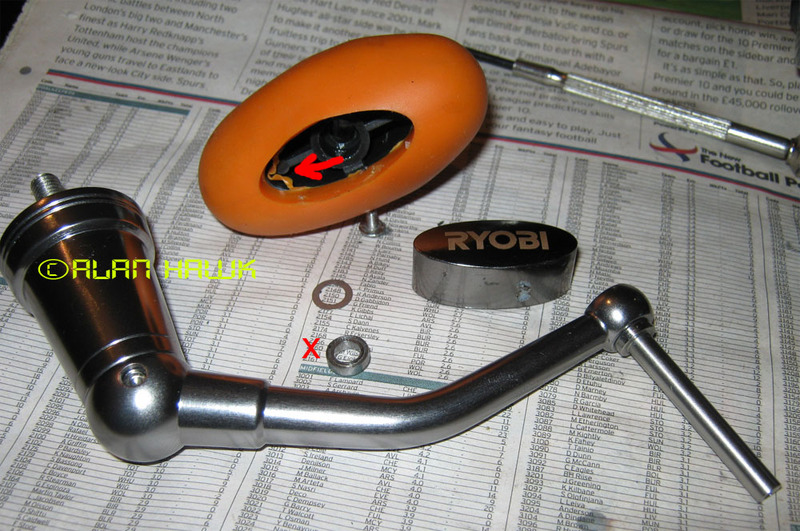 This problem is not exclusive to the Ryobi though, as the same thing happens to the $1250 new Saltiga as could be seen in its own review (18th photo from the bottom). It's an inherent issue with locomotive oscillation. 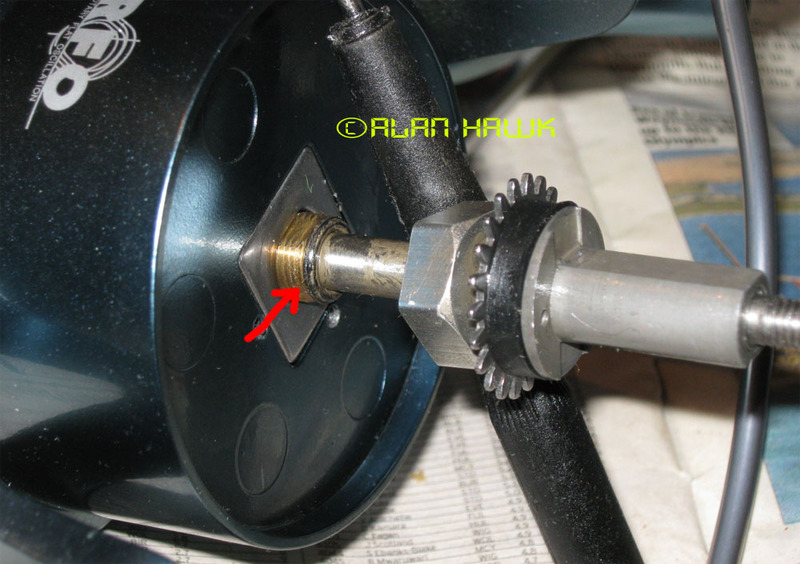 You can't mount a gear on a single bearing and expect it to remain perfectly stable because of the internal play between the races of a ball bearing. 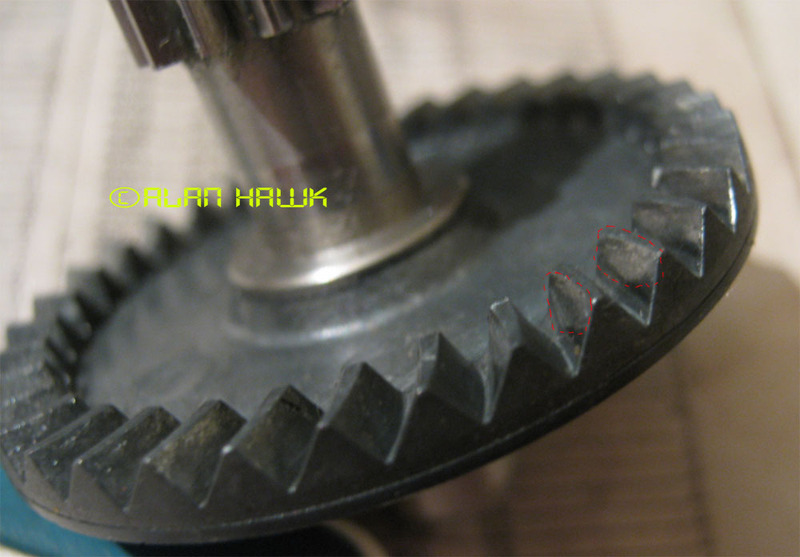 Another reason why worm gear oscillation is a superior design. 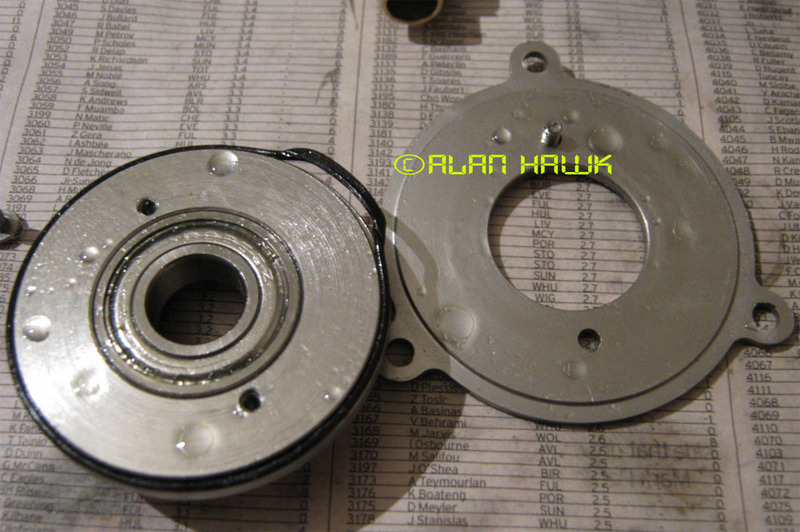 In order to reach the anti reverse/pinion assembly, this unit housing the main rotor's bearing needs to be removed. 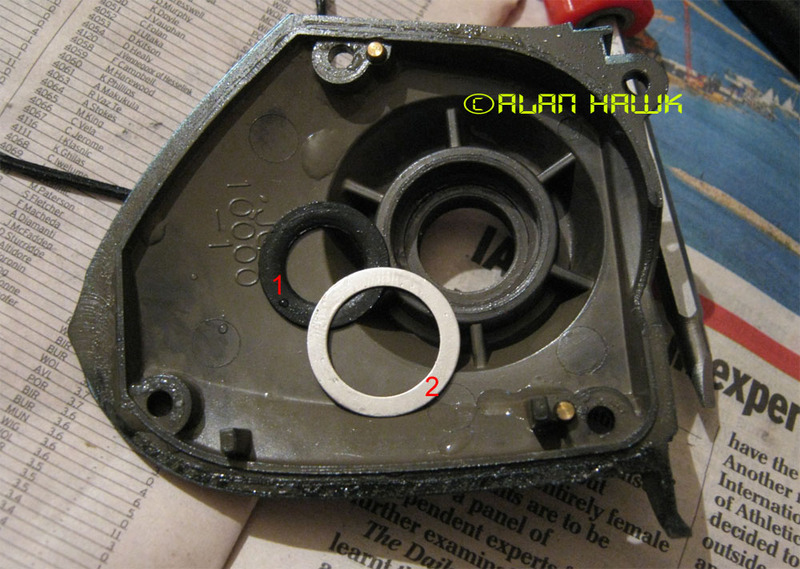 The unit has an O ring seal around it to keep water out, and to my absolute frustration I found that the O ring was not fitted properly at the factory, causing a large part of it (red arrow) to be smashed between the unit and the reel's body, and leaving a gap in the sealed perimeter. This is a combination of very poorly trained assembly personnel and loose tolerance. Had the O ring been tight enough that wouldn't have happened even if the most careless person on earth was assembling the reel. 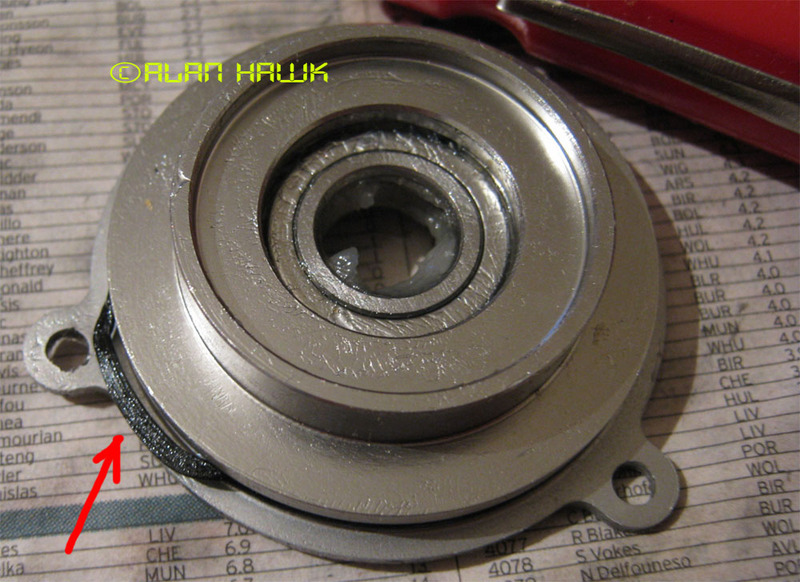 The unit taken apart for a better look at the main ball bearing and the smashed O ring. This is more disappointing than anything I've seen in a long while. And guess what happens when that critical area is protected by an oversized seal fitted in that careless manner? Water! A lot of it!! Just to show you how much water was there. 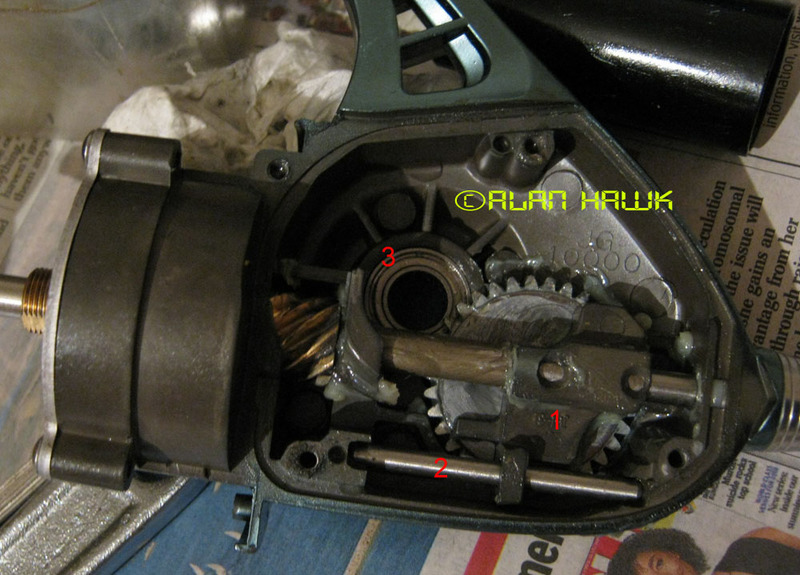 The reel has two large instant anti reverse clutches (#1), seen in the photo above along with the machined brass pinion (#2) and the two clutch sleeves (#3). 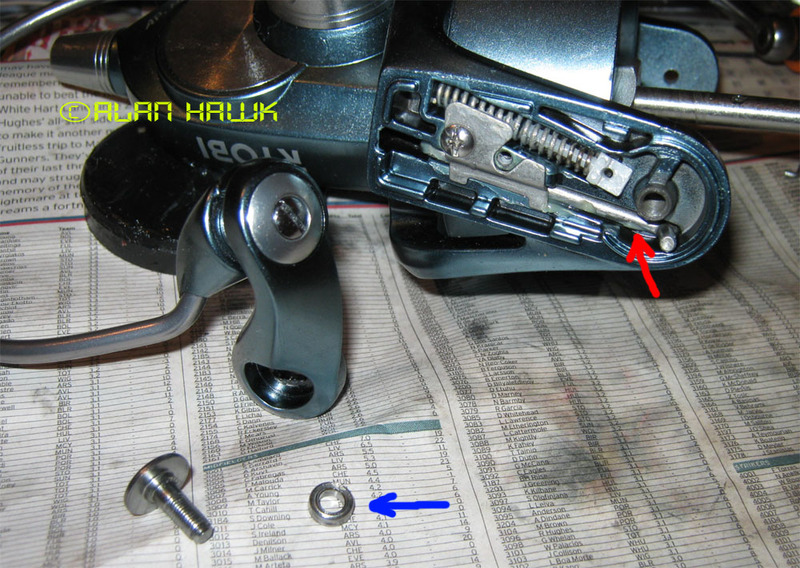 Using two clutches is a great idea that is copied from Daiwa's 1998 high end reel TDX HIA which was the subject of my very first reel review in 1999. 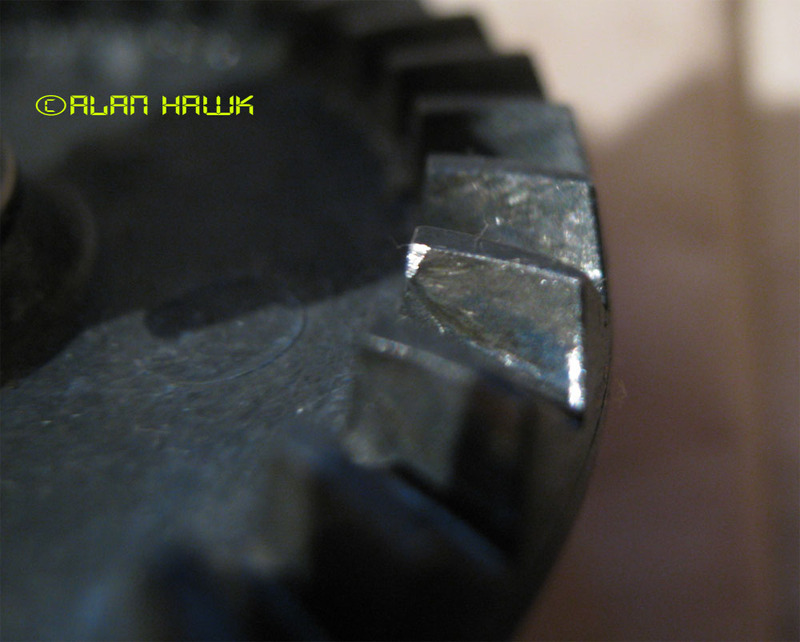 The two clutches design is great because in addition to increasing the strength of the grip on the pinion, it eliminates the need for a back up brake. If one clutch slips, the other will keep the pinion securely gripped and you wouldn't even notice. The chances that both clutches would slip at the same time are astronomically low, unless of course both clutches wear out severely at the end of their service life. With all that security on mind, I was quite at loss when the rotor started developing back play near the end of my tests! I just didn't know why it was deteriorating like that. The reel has been used on 6 trips, totalling around 45 hours of operation all in all, almost exclusively dropping jigs weighing only 200g. I knew that it has less than 15kg of max drag, so I did not chuck live bait to huge groupers nor did I target sharks for the kicks. It mostly caught small AJs and larger Meagre up to a maximum of about 22kg (48lb). That is not at all abuse considering that according to the ads it's supposed to be a reel for Tuna and Marlin. 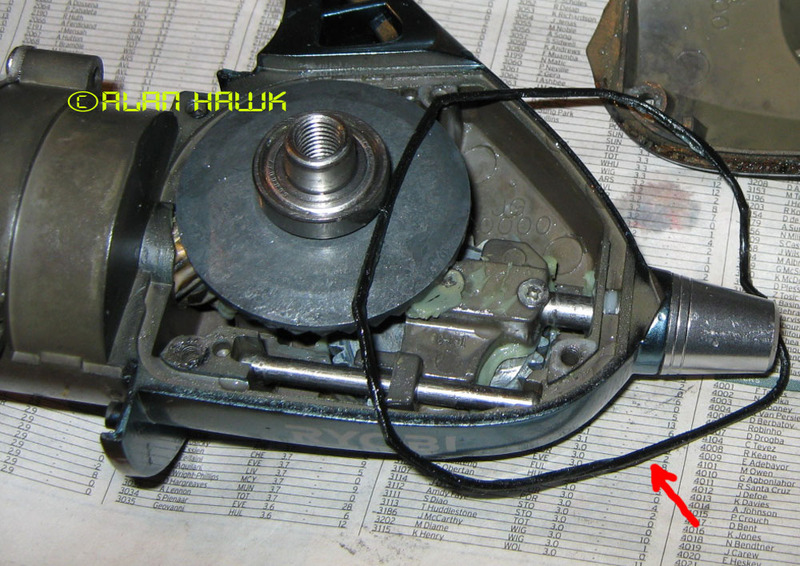 The red arrow points one of the brake cylinders and its little leaf spring. I fund that those little leaf springs were placed next to each brake cylinder arbitrarily without any means of keeping those springs in place! Here it is. Battered and chewed in the moving parts before it was thrown to get stuck in a smudge of grease on the side wall where I found it. Only God knows where the other two are. The bail mechanism is reliable. 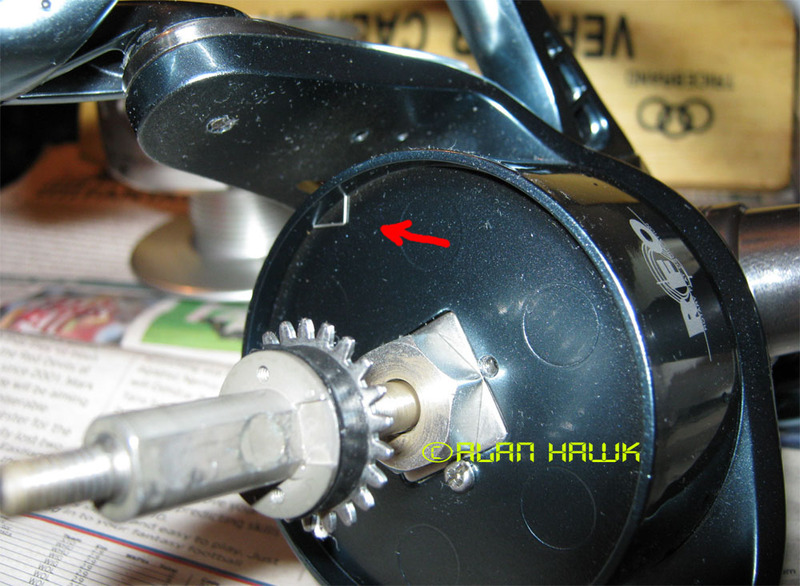 The red arrow points the lever that engages the brake ring to stop the rotor when the bail is opened, and the blue arrow points the little ball bearing that the bail arm is mounted on. This is a very interesting design feature. 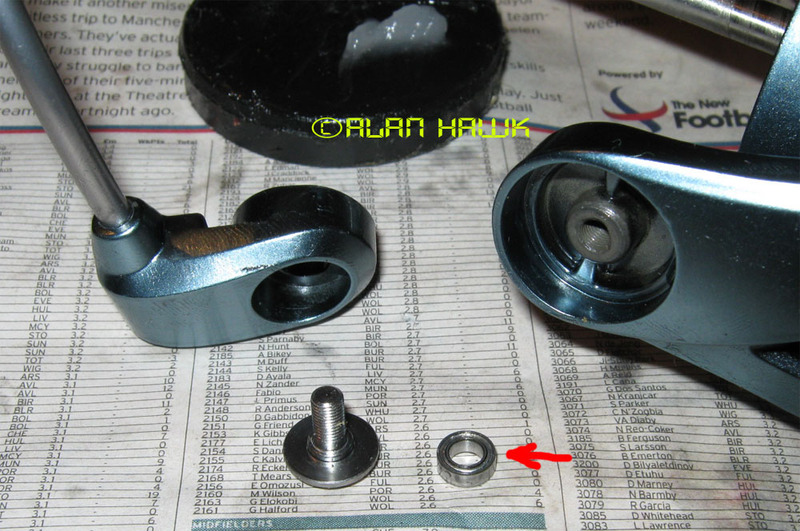 Not sure if I had seen a bail that runs on ball bearings before. 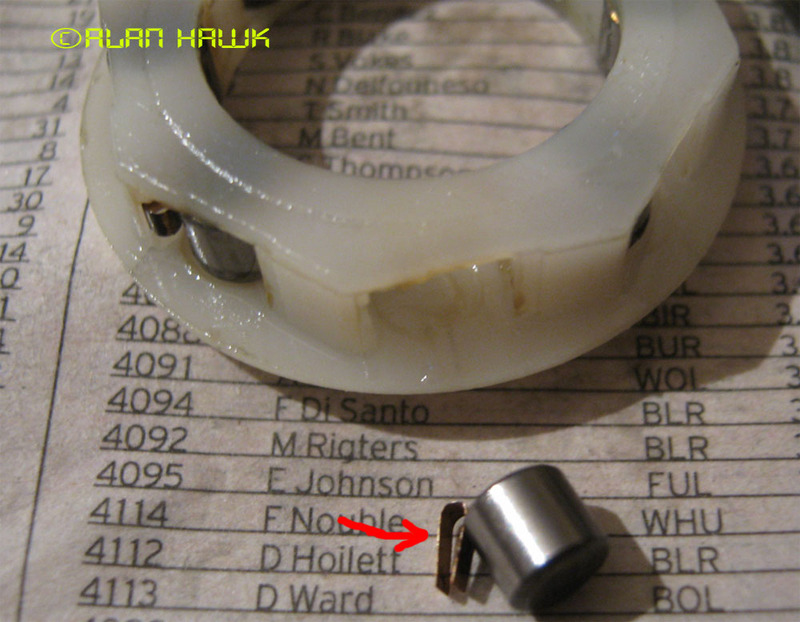 The other end of the bail is mounted on a ball bearing as well (red arrow). This is the shiny cover of the bail mechanism. 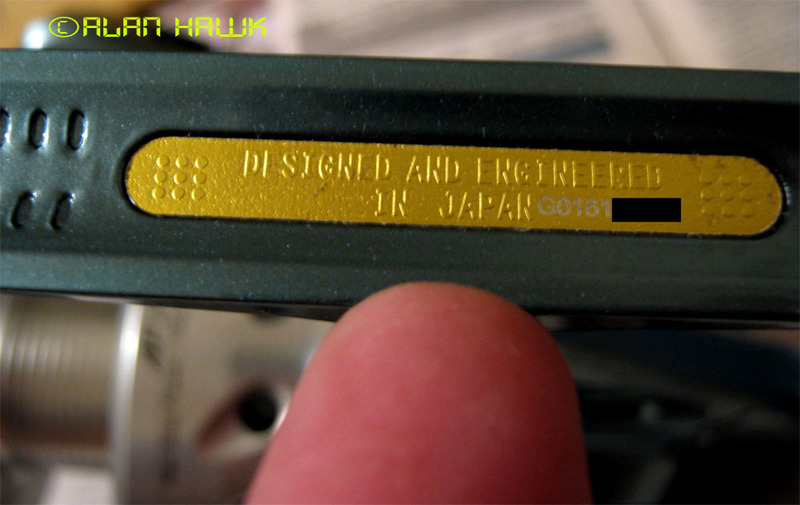 It's made of sheet metal, and the blue arrow points to where the black spacer fails to stay on the rim causing a slight tilt in the entire cover when it's screwed to the reel. More badly fitted parts. And lastly, the line roller. Straight forward three pieces setup with a single ball bearing. It works alright. Well, not sure what to say here. This reel is absolutely disgusting. I never used such a word to describe a reel before, but the Carnelian truly lowers the bar to new depths. I don't know how many times I mumbled "WTF" to myself as I was making one appalling discovery after another inside it. You've known me for more than a decade now and you know that I always try to see the bright side and point out any potential for improvement I see in a reel, but there is no point in trying that here. The Carnelian is badly designed, extremely heavy, needlessly complicated, cheaply made using comical components, assembled by people who couldn't care less, and all of that was manifested in poor performance and unpleasant time on the water. I am declaring this reel the single worst reel I have ever tested in my life, and I'm moving on. 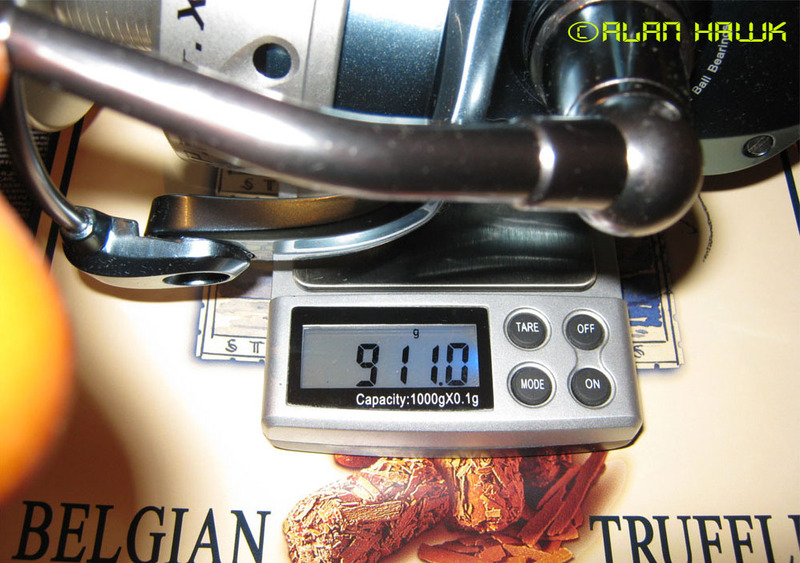 This review was on the back burner and I was using my free time to fish other reels, but the number of enquiries I received about the Carnelian kept growing, particularly from Australia, and therefore I brought it to the top of my list and took it out one final time then took it apart for this report. Normally I use reels for a bit more before I review them, but I was quite satisfied that the reel has revealed all its secrets, therefore my decision to end the field testing and write this piece. I hope that you've enjoyed the read and found it useful. Coming next is the bailed Van Staal 250, followed by either the Van Staal VM150 or the M&W Ocean Wolf (also sold as "Canyon DJR 6500").